Well folks, this really is my last weekend here in Barcelona. This has been a completely surreal experience and I don’t know where to begin. We are actually in the single digit countdown and it is starting to hit me that we are leaving. I started the Saturday as any other student would – preparation for my communication final. Ok, a little sarcastic as I am sure when I woke up around 8 or 9, many other students were just getting to bed from the previous night’s adventures. It isn’t too bad of a final and I pretty much finished it later in the afternoon at Starbucks. As it is my last Saturday, I didn’t mind waking up early and making the most of it. Around 10:40, Liz and I left the apartment to meet a bunch of other runners at IES for a Saturday fun run in Collserolla Park, located near Tibidabo on the back side of Barcelona. I was actually impressed with the turnout we got – almost 10 people. We took the local tram/train starting from Plaza Catalunya up to the mountain below Tibidabo. The start was about 5 minutes along a purely uphill climb. At the top, we ran along the trails that looked out to the ocean and back towards IES. It was one of the most beautiful days we have had here. Crisp, clean air surrounding us, people jogging, walking, and biking the trails, and a full day ahead of us. This was where Liz, Sam, and I had hiked a couple of months ago, but under very different weather conditions. I preferred today’s by far. At one point, we were off the trails and roaming the streets when Josep, one of the teacher leaders told us we were lost and he didn’t know where we were. Brilliant. 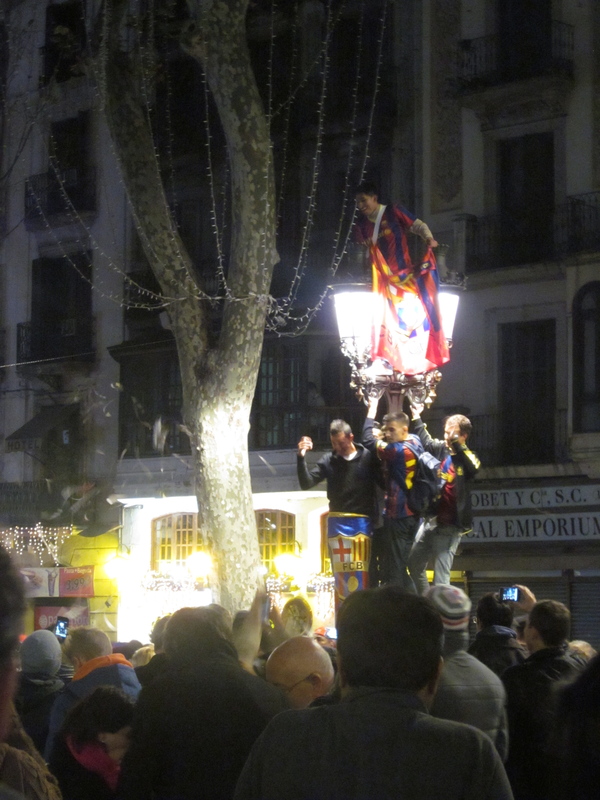 After a little zig-zagging, we were back amidst the crowds and throngs of people in Gracia. Liz and I cut off from the group in order to make it back to the apartment. It really didn’t make much sense to jog back to IES and then take the metro home when we could run home. Run, check. Shower, check. Snack, check. 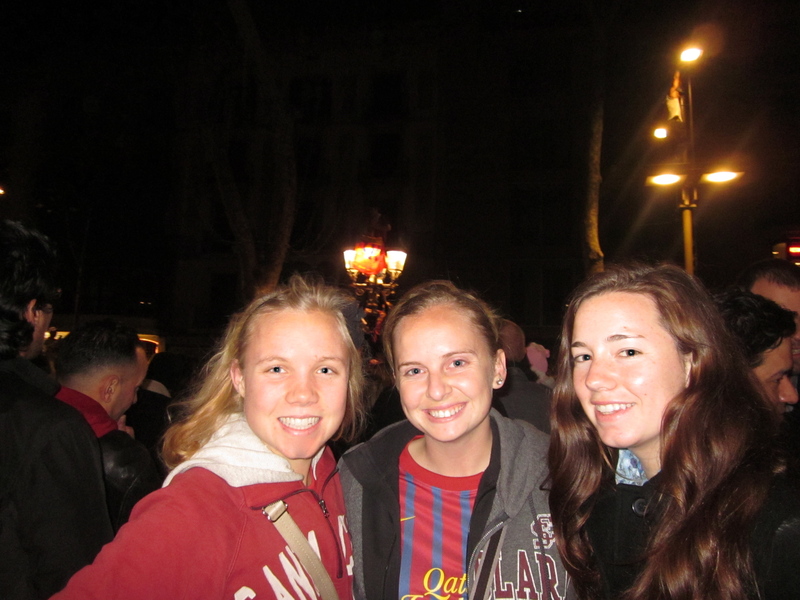 We met Bonnie at one Starbucks by Plaza Catalunya in order to work on our communication finals. I think we were in the same area from about 2:30 until 7. We of course chitchatted over a latte (duh) when we first arrived, then got down to business. Around 5:30, I think all of our brains were fried and so we decided to take a walk around Passeig de Gracia and into El Corte Ingles. We were attempting to find images to analyze for one of the essay questions – one regarding the image of men and women in advertising. I ended up buying a Spanish fashion magazine as I felt guilty taking a picture with the man staring right at me. Bianca had met us earlier at Starbucks, so we were able to leave our bags with her while we wandered. As Liz pointed out, once you know where one Starbucks is, the rest suddenly appear everywhere you go. I think we were pretty oblivious the first few months, but Spain also does an excellent job at hiding them along the streets. They are tucked into corners and in between stores, but they still seem to pop up every mile or so, like in the states. We had asked if Conchita would be willing to make dinner early for us, which she was a doll and was. Around 8:30 (a whole ½ hour early! ), we dined on salmon (although it tasted more like halibut in my opinion), salad, tortellini (not the best, but I scarfed it down), and I skipped the baguette tonight. We were supposed to meet our friends around 9 to scout out places to watch the Barca game, but ended up getting to Plaza Catalunya a tad bit late. Bonnie, Liz, and I waited for Noellia and Bianca for about a half hour, met up with them, attempted to walk into George Payne’s but were denied entrance, picked up a few mini bocadillos for Bonnie from Montaditos, walked back towards Catalunya to see if we could find a bar, failed then took the metro back to Conchitas. I think we have the best senora ever. Conchita was so sweet about letting us bring Bonnie back and even watching the game with us. I swear without her (and Liz too! ), this would have been a much different experience. Anyways, Barca had tied the game 1-1 before we returned and scored two more goals in the second half. Just before the end of the game, the three of us sprinted back to the metro and down to Las Ramblas to catch the post-game mob. After every match that FC Barcelona wins, crowds of people go to the Canaletes fountain just off Las Ramblas to celebrate. People were yelling the cheers, standing on light posts, even on the fountain. We stuck around amidst the mob for a bit, soaking up every last bit of the Catlan soccer culture. What a night and Barcelona for the win.